NASHVILLE, Tenn. — Betsy Manning was a bit unsure about a life in trucking during the early days of her marriage with Dave Manning, the incoming chairman of American Trucking Associations. But she’s acquired a taste for it during their run of nearly five decades together. “Betsy thought I was going to be an orthodontist while we were dating,” Dave Manning said, just as his father was a dentist. The profession offered a good income with regular hours and no after-hours phone calls. “It would have been a good life,” she said in a recent interview at the headquarters of TCW Inc., where Dave is president, but she learned that was not where his heart was. “Early in our dating years he was working at his uncle’s trucking company, loading high and tight, he would say. He had an energy and a passion for the industry, so he switched his college major,” Betsy said. The couple met in seventh grade, “but it wasn’t until ninth grade when we started liking each other,” she said. They married in 1975 at age 19 when he was attending Tennessee Tech in Cookeville. Betsy had a front-row seat for Dave’s journey from boy to man. When they first met, “He had a flat-top haircut and a pocket protector for his pens. And then his hair grew out and there was no more pocket protector — and those big, blue eyes,” she recalled with fondness. “I wore him down,” she said of their path toward marriage. “He’s high in integrity and great at building a consensus,” she said of her husband of 42 years. 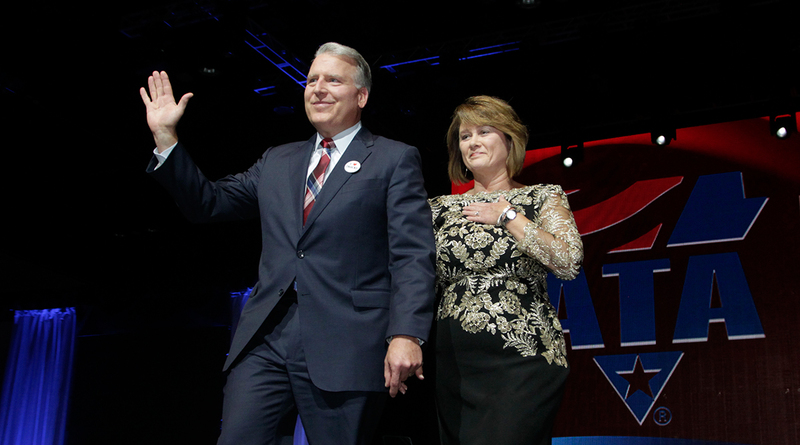 “He’ll work tirelessly and passionately for ATA,” she said. “There’s always the unusual, the interesting,” she said of the industry in general. Betsy said she has seen both sides of Dave’s dedication. Beyond the company where he has worked since 1985 and Betsy, their son and daughter, Brian and Jennifer, and six grandchildren, Dave finds time to teach Bible study classes twice a week. “He’s really a good teacher, close to preaching. He helps make the Scriptures come alive and relevant to our daily lives,” she said. As for a hobby, it’s six pleasure horses on the family’s farm. In fact, horses were incorporated into some of their first outings while dating. “He’s a great horse rider and showman. He has a presence and leadership with the horse. He’s won many blue ribbons showing Tennessee Walking Horses. Our 27-acre farm, barn and horses are his outlet, his relaxation, his peace,” she said. For the next 12 months, though, trucking will be the big issue.